Most items can be shipped the same day if ordered before 12:00 Noon Eastern Time (9 AM Pacific Time). 5' sections of Spiral Pipe can be shipped via UPS. 10' lengths must be shipped common carrier LTL which will require a pallet to be made at additional cost. Some large or oddly shaped items may require special packaging or crating at additional cost. The transit times shown above do not include weekend days or holidays and are not guaranteed. Service to some remote areas may require additional delivery days. UPS occasionally revises delivery schedules due to changes in distribution and volume, especially during holiday periods. UPS 2nd Day and Next Day delivery are available provided you allow us sufficient time to pack and process your order. Please call (877) 904-4022 or (586) 776-9224 for availability and pricing. The map above is a general representation of transit times to commercial destinations. In limited areas, transit times may differ for residential destinations. FedEx Ground business days are Monday through Friday (excluding holidays). 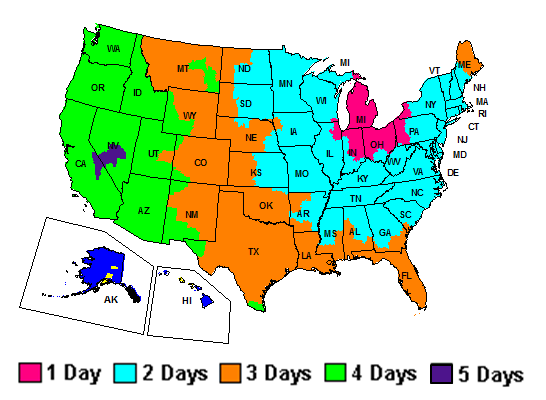 FedEx Home Delivery business days are Tuesday through Saturday (excluding holidays). FedEx 2Day and Overnight delivery are available provided you allow us sufficient time to pack and process your order. Please call (877) 904-4022 or (586) 776-9224 for availability and pricing.